The history of science is replete with instances of multiple discovery—the more or less simultaneous announcement of essentially the same breakthrough by independent researchers. Still, it may still seem uncanny that two separate research groups not only produced a draft map of the human proteome, they also published their results the same day in the same journal. While the mapping of the human proteome may not prove to be as epochal as the formulation of calculus by Newton and Leibniz, or the development of evolutionary thought by Darwin and Wallace, it is still vitally important. By comprehensively cataloging human proteins, the Baltimore/Bangalore team and the Munich team have created a resource for other researchers that promises to advance personalized medicine. The dual papers seem a little less coincidental when one considers that both research groups faced similar challenges and exploited similar technologies. As a result, they were almost fated to enact similar strategies and uncover similar findings. Studying proteins is far more technically challenging than studying genes because the structures and functions of proteins are complex and diverse. Moreover, a mere list of existing proteins would not be very helpful without accompanying information about where in the body those proteins are found. 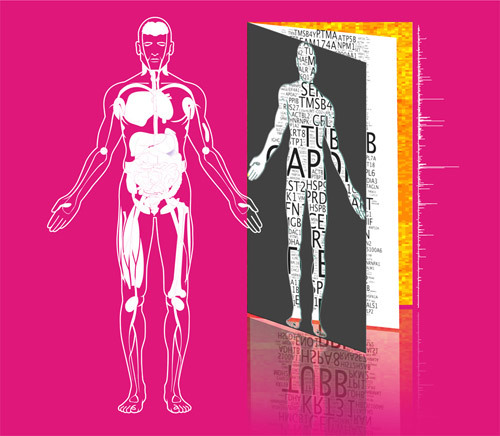 Most protein studies to date have focused on individual tissues, often in the context of specific diseases. To address these challenges, both research teams took advantage of mass spectrometry, which has revolutionized proteomics studies in a manner analogous to the impact of next-generation sequencing on genomics and transcriptomics. In addition, both teams compiled information about the types, distribution, and abundance of proteins in various cells and tissues. For example, the Baltimore/Bangalore team conducted in-depth profiling of 30 histologically normal human samples, including 17 adult tissues, 7 fetal tissues, and 6 purified primary hematopoietic cells. While working up their dataset, the Baltimore/Bangalore team identified proteins encoded by 17,294 genes, which is about 84% of all the genes in the human genome predicted to encode proteins. The Munich team reports that it cataloged over 18,000 proteins. The Baltimore/Bangalore team indicated that it had identified 193 novel proteins that came from regions of the genome not predicted to code for proteins, suggesting that the human genome is more complex than previously thought. Similarly, the Munich team noted that it had discovered “hundreds of protein fragments that are encoded by DNA outside of currently known genes.” These new proteins may possess novel biological properties and functions. Both teams cited the challenge of “missing proteins”—proteins that should exist, given what we know about the genome, but remain unobserved. “The depth of our analysis enabled us to identify protein products derived from two-thirds (2,555 out of 3,844) of proteins designated as missing proteins for lack of protein-based evidence,” wrote the Baltimore/Bangalore researchers. “Several hypothetical proteins that we identified have a broad tissue distribution, indicating the inadequate sampling of the human proteome thus far.” The Munich researchers speculated that some missing proteins may exist only during embryonic development. These scientists also suggested that many known genes have simply become nonfunctional, such as genes believed to code for olfactory receptors—an indication that modern humans no longer rely on a sophisticated sense of smell to survive. Committed to helping other researchers identify the proteins in their experiments, the Baltimore/Bangalore team has made its human proteome catalog available as an interactive web-based resource at www.humanproteomemap.org. Similarly, the Munich team, together with software company SAP, has made its inventory freely available at www.proteomicsdb.org.